Above: In a Greek garden: Brahea armata (left) and Trithrinax acanthocoma frame Trachycarpus. Below: Pritchardia hillebrandii, young plant, showing its beautiful, broad leaves. Having read three issues of Chamaerops I decided to write down my own experiences of growing palms in temperate zones. However for a change it is not an English garden that is to be described but one in Greece. Only two years have passed since I became a palm collector and I possess at this time over 70 specimens most of them originating from Mr Spanner in Munich, to whom I am very thankful for giving me precious advice. Almost all my palms are in my Greek garden, which lies in a coastal area near Athens. The climate there is warm temperate with hot summers (and warm autumns) and frost-free winters. These conditions are ideal for palm growing, provided one uses artificial irrigation, because the warmest months are extremely dry, raining as rarely as once a month. 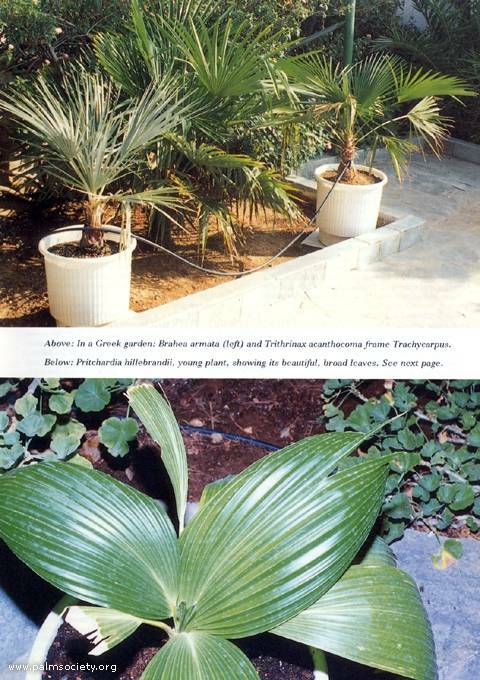 Unfortunately cultivation of palms in Greece is currently restricted to Phoenix (canariensis, dactylifera and theophrastii) and Washingtonia species (even Trachycarpus being rare) and therefore it is pure luck to find other species in Greek plant stores and even then at outrageous prices. Occasionally I come across Butia, Chamaerops humilis, Livistona chinensis, Ravenea rivularis, Phoenix roebelenii, Syagrus romanzoffiana, Archontophoenix alexandrae and (as indoor decoration) Chamaedorea elegans, Howea forsteriana and Chrysalidocarpus lutescens. For this reason I buy the palms in Germany, where I live most of the time, mainly from Mr Spanner as mentioned above and carry them with me, each time I visit Greece. The main problem of this undertaking is their acclimatisation as they have grown in Germany under greenhouse conditions, while in Greece they have to grow outdoors either in the ground or in pots. Besides this they will have to cope with truly cold or cool temperatures during the winter because I don't have a greenhouse. As an additional negative factor must be mentioned that many plants are only seedlings, which means they are more tender. Of greatest importance is that the environmental change should take place only during the warmer months. Once I brought palms at Christmas and even the most adaptable ones suffered damage, five specimens (Euterpe edulis, Macrozamia moorei, Rhopalostylis sapida and baueri, Jubaeopsis caffra) finally perished. Unaffected were Rhapis excelsa, Rhapidophyllum hystrix, - and to my astonishment - Pritchardia hillebrandii and Phoenix rupicola! All others (among them Ravenea rivularis, Phoenix zeylanica and Hyphaene natalensis) recovered in the following summer nevertheless their growth was set back for one year. It is not so much the low temperatures in winter which represents a critical situation, as the combined effects of cold and wet; most rain in the Mediterranean falls during the winter. So it is essential that counter-measures should be taken. First of all the soil must be well drained. This increases the watering needs during the summer but also the survival chances in the cold season. In this respect the most unsuitable soil even as an ingredient is clay. The pots also must not be too big and potted plants should be protected if possible from rain; watering once monthly is more than sufficient. Even during April I do not dare increase the watering although new growth is beginning, because a cold snap could cause greater damage than at the dormant stage. Finally I would like to mention those palms which adapted most quickly to the Greek climate: almost all Phoenix species, all Braheas, Archontophoenix alexandrae and purpurea, all Sabals, Chambeyronia macrocarpa, Thrinax radiata, Acrocomia totai and Ceroxylon alpinum. On the contrary Hedyscepe canterburyana and Oraniopsis appendiculata could not acclimatise and perished rapidly. A specimen of Ceroxylon quindiuense though it grew in a satisfactory way generally, finally did not survive an occasional 37¾C. In conclusion it may be said that palms which grow in cool and moist habitats do not adapt as well to the Athenian climate as those from warmer regions, even if winter in these areas is unknown. Good soil and a restrictive watering policy help considerably the latter species to tolerate Greek winters.